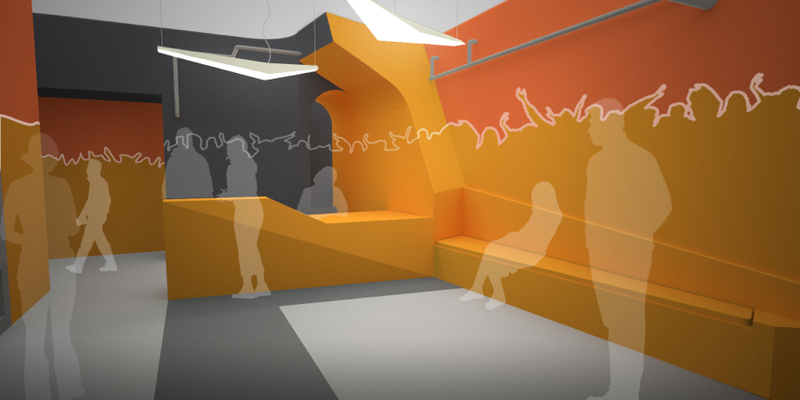 Rendering of the reception area at the American Rhythm Center in downtown Chicago’s Fine Arts Building. Image courtesy of the Chicago Human Rhythm Project. Last spring, it went by the Collaborative Space for Sustainable Development and involved six performing-arts organizations. Per a public announcement today, it’s called the American Rhythm Center, includes nine organizations and has a confirmed home: the Fine Arts Building. Built for car and wagon manufacturer Studebaker in 1885, the richly detailed landmark stands adjacent to the Auditorium Theatre, facing Grant Park on Chicago’s South Michigan Avenue. Lead partner the Chicago Human Rhythm Project says it’s raised about half of $2.5 million for the ARC’s initial, multiphased capital campaign. The facility will first see foot traffic by the end of CHRP’s 22nd annual “Rhythm World” festival, July 23 through August 5; a grand opening with the founding partners will follow in September. Those partners are, in addition to CHRP, Cerqua Rivera Dance Theatre, the Chicago Chinese Cultural Institute, the Chicago Youth Symphony Orchestra, Giordano Dance Chicago, Luna Negra Dance Theater, Ping Pong Productions, River North Dance Chicago and Kalapriya, Center for Indian Performing Arts. Phase one of the project builds out and renovates a lobby, dressing rooms and administrative offices, plus three studios ranging in size from 750 to 1,500 square feet. During subsequent construction phases, the ARC plans to add more administrative room and spaces for programs, plus a black-box theater for performances. The architect is JGMA and Ujamaa Construction, Inc. is the general contractor. In a joint interview by phone on July 5, CHRP founder-director Lane Alexander and new executive director Frank Sonntag explained the thinking behind this model for supporting performing-arts management and education in collaboration, and how it found a home in the Fine Arts Building. “That building is a gem,” Sonntag interjects, “but a little underutilized.” With consensus among the member organizations, a deal was finalized and because the CYSO was already in residence there, the ARC gained a new partner. Repurposing the Boitsov’s two studios on the third floor and creating a third by gutting the company’s offices and storage has been the first order of business, says Alexander, “so classes can begin as quickly as possible and we’re all able to start generating revenue and stabilize operations.” As CHRP programs tap and percussive-dance forms, while other partners focus on dance performed in soft shoes or bare feet, two studios will have multipurpose Timestep floors by Stagestep. Alexander notes that collaboration can take various forms, and that the ARC is dedicated specifically to institutional cooperation as opposed to artistic exchange, “although some artistic collaborations may grow out of the institutional collaboration.” Discussions among ARC members have started about which “back-end” functions might be better combined than sandboxed, such as bookkeeping, fundraising, marketing or programming. Alexander and Sonntag are already talking with educators about opening the project up as “a laboratory” for undergrad and graduate arts-management studies. “Ultimately, we want to see this grow organically,” says Sonntag. “We don’t want to be the 800-pound gorilla, saying, ‘This is how you’ve got to do it.’ But I can definitely envision the day when we’re jointly marketing this place. I mean, put all of these class offerings together: It’s more diverse than any one of us could do on our own.” MINDBODY software will facilitate unified online registration and class-schedule information, with clear notation of which partner is offering each class. “One of our promises is to make it simple for the student,” says Alexander. Chicago Human Rhythm Project’s 22nd annual “Rhythm World” festival begins July 23. By its end on August 5, the American Rhythm Center will begin initial operations in the Fine Arts Building at 410 South Michigan Avenue in downtown Chicago, with a grand opening scheduled for September and further development ongoing. Nice! I will definitely be checking out the Mindbody software.